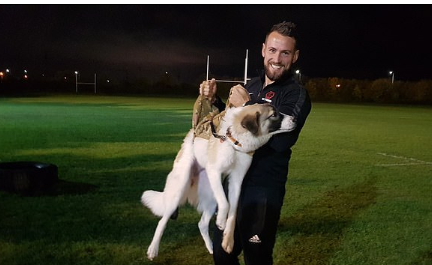 This week in Wonderfully Adorable Doggo News; an ex-soldier has been reunited with the adorable little puppy he saved from the violent war zone he was stationed at. Ahhhh! 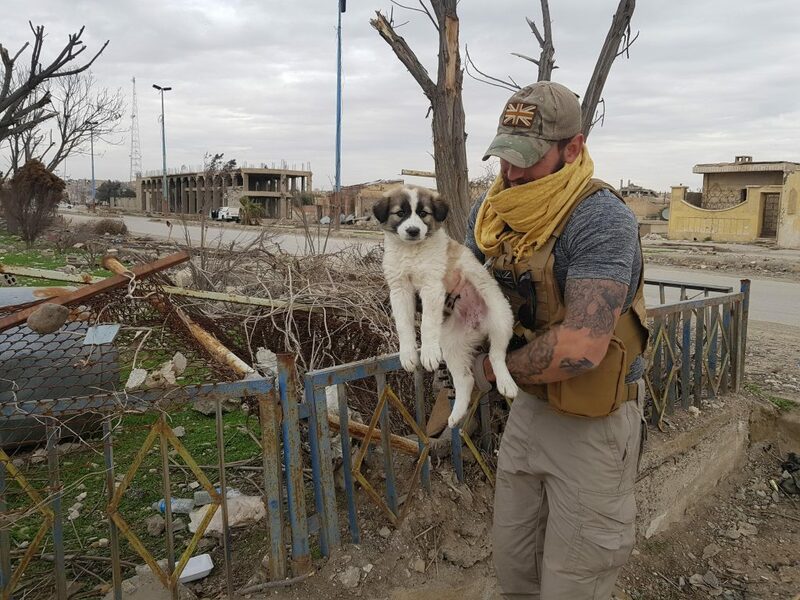 Sean Laidlaw stumbled across terrified little “Barrie” (yes, he picked the name himself) who was hiding and whimpering among the rubble after a massive explosion, while Laidlaw was serving in a bomb disposal unit in Syria. After providing the poor little pooch with food and water for three days, the two soon became completely inseparable. In fact, Laidlaw, the private contractor, says that little Barrie saved his life. Inseparable that is, until Sean’s contracted ended seven months ago and so the dynamic duo were separated by thousands of miles for the first time ever… and to make matters even worse, Sean wasn’t 100% if he’d ever be able to see his doggo bestie ever again. Alas, as you know, the tale has a happy ending. After seven anxious months of hoping, wishing and waiting around, it was confirmed that the pair would finally be reunited on Saturday 3rd November. 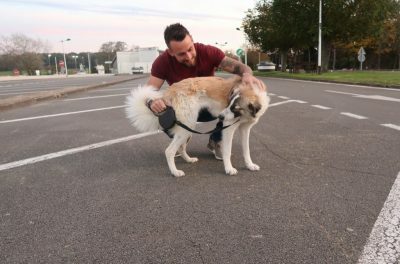 The reunion was to happen in France, at the Charles de Gaulles Airport, and Sean says that it was the ‘happiest moment ever’. SO. CUTE. “I feel like it may come across that I saved Barrie’s life, but I feel like she saved mine. “Working in a war zone, coming back to camp you sit in your room on your own. To have a companion you can play with and train, it kept my mind away from all the things I was seeing and doing out there. 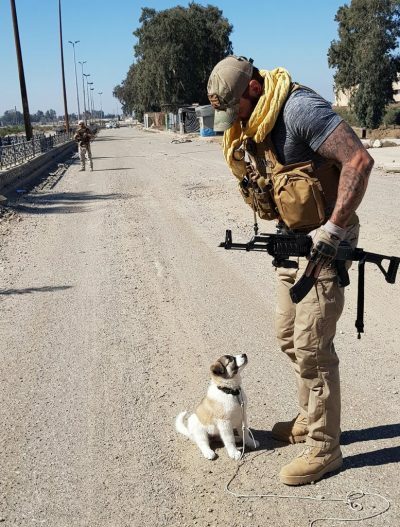 “You can only imagine how bad Syria is, and to be able to come back to the camp and train her for three hours, take her for a walk, things like that really took my mind away from where I was. It gave me a bit of normality, she definitely kept me sane. “She stayed with me all day, every day. She did jobs with me, I’d wake up, she’d come eat with me, she’d then sit in the passenger seat of my car when we drove to Raqqa. “Having a companion, is one of the best things to help with PTSD. A dog always makes you happy, always wants to be with you. “Going to Paris was both exciting and nerve-wracking, but I left the house at 6am and just sped there. “Meeting her at the airport, seeing her in the flesh, was one of the best moments of my life. I’ve never been so happy. Sean found Barrie in Raqqa, back in February. She was nestled among the wreckage of a school which had been blown up, and to make things even sadder, she was surrounded by four dead puppies, and she was terrified. Understandably, Barrie rejected Sean at first, but this did not deter him. Everyday Sean made she was safe and continually brought her food and water and made sure to corner off the area she was hiding as it wasn’t yet safe from IEDs. 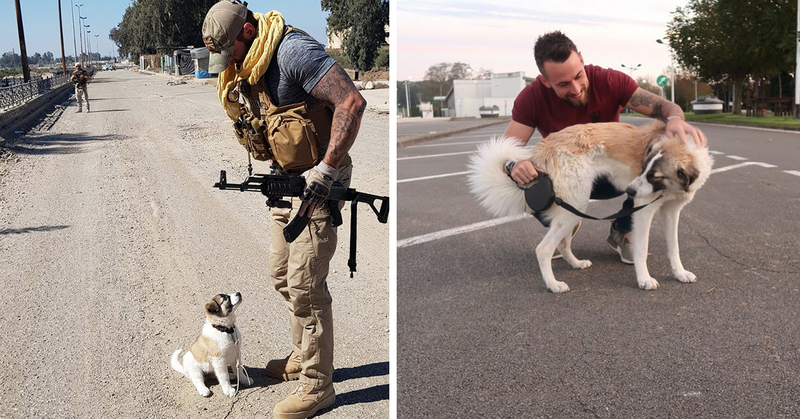 It only took 3 days before the two became inseparable and from that moment on, wherever Sean went during his 3 months in Syria, Barrie would follow. Sean even went as far to create a harness out of a bulletproof vest and her own little teddy bear in order to protect her. “I think as soon as Barrie and I bonded, where I could pick her up, for me she’d already become my dog. “When we got back to camp, she lived in my room, I looked after her, I was responsible for her. She slept in my room, I was training her, I was feeding her. And because of this Sean was desperate to reunite with his little side-kick, so he contacted a charity in Iraq named War Paws – which basically specializes in bringing dogs “home” from war-torn areas – in hope that they’d be able to help him get her back to the UK once his contract was done. In fact, he even set up a Gofundme page and managed to raise £4,500 to help him cover expenses. However, he soon found out that it wasn’t going to be that easy. And it seems Barrie had quite the adventure herself. 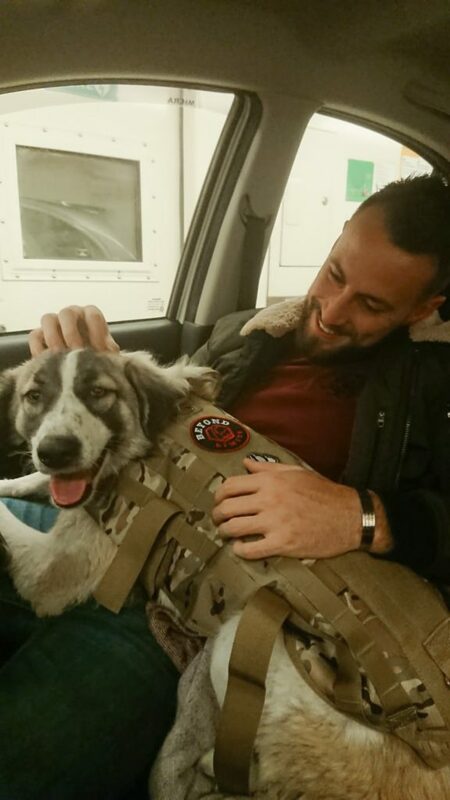 War Paws brought Barrie to Iraq in April where she was vaccinated and checked before being flown to Jordan in August. She was then quarantined there for a further two months. Sean returned back to the UK for a short visit after only four months in Syria. During his time in the UK, he got the news that his contract had in fact been abruptly canceled so he would not be returning to Syria… Sean thought he may never see Barrie again. Devastated, Sean even offered to fly to Jordan himself in order to pick up Barrie up after the plan to fly him to Heathrow collapsed because Barrie was missing paperwork. Talk about a series of unfortunate events! However, a last-minute hero, Louise Hastie (aka the owner) of War Paws came to the rescue. She was already flying two dogs from Jordan to Paris, and made sure that Barrie was able to join them too. “All the help we’ve received to bring us together has been amazing, just to bring one dog to Essex, it’s been incredible. “Thinking about having Barrie with me now, the life we can have together – it’s surreal. “One of my biggest fears was that she wouldn’t recognize who I was, or that she would be a different dog to the girl I left. “It was pure joy when she realized who I was. She’s exactly as she was back in Syria, it was just great to have my dog again. What a truly lovely, heartwarming story! I’m so glad the pair were eventually reunited and can’t wait to see how they do together back home in the UK in the future!